One of the things that always impresses me about coffee is how they are able to blend so many different flavors into the traditional coffee blend. For someone who drinks coffee almost every morning, being able to enjoy coffees that don’t always taste the same is a treat. Around the holidays, many of our familiar coffee houses are introducing coffee varieties that embrace the holiday season. Sometimes I wish they would offer the holiday flavors year-round, but maybe that’s how they get us to stock up and store our favorites. Dunkin Donuts has recently introduced their line of limited-time-only-get-it-right-now holiday flavors, including Vanilla Nut, Pumpkin Spice, and Mocha Mint. Whether it’s a Halloween party or Christmas dinner, the holidays are the perfect time for a gathering with friends and family. 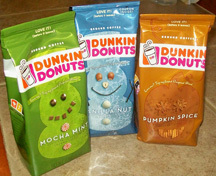 Celebrate this season with new holiday flavors from Dunkin’ Donuts® packaged coffee that you can enjoy at home! For a limited time only, Dunkin’ Donuts packaged coffee, available wherever you buy groceries, offers special holiday flavors in Vanilla Nut, Pumpkin Spice and Mocha Mint varieties. WiC Chick KP, of My 3 Little Kittens, helped us to try these three special varieties. The experience was positive from first sniff, with the aroma seal on each packaging giving you a hint of what the blends would taste like. As an added bonus, the bags have an easy close feature to help keep the grounds fresh and flavorful. If you love dark chocolate and you love mint, this is the blend for you. The aroma just tempts you to drink this coffee. 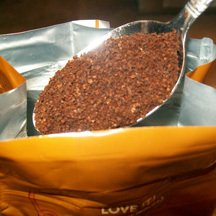 It is a medium strength coffee, with a very strong aroma but a milder flavor. If you love the blend of chocolate and mint, like KP’s husband, this may be the blend for you, but if you want a strong true coffee flavor, check out the Vanilla Nut. I remember the first time I tasted a pumpkin spiced coffee drink. I just didn’t see how it could world – pumpkin and coffee? It’s like taking a bite of pumpkin pie and washing it down with coffee…which, come to think of it, many people actually do around the holidays. 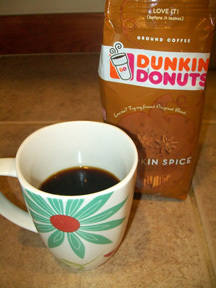 The Dunkin Donuts blend probably captures that experience – coffee flavored pumpkin pie with a ton of spice. One winner will receive a Dunkin Donuts serving tray. In the comments below, tell me which of the three flavors you’d like to try the most and when you would enjoy that hot cup of coffee. 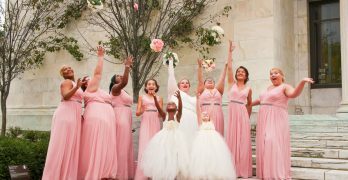 For a bonus entry, subscribe to The WiC Project via reader or via email and leave a comment letting me know that you have. Giveaway ends at 11:59 PM EST, October 25, 2010. Disclaimer: This post consists of my (and/or fellow tester) opinions only. No compensation was given for this review/giveaway. KP did receive Dunkin Donuts Coffee from the manufacturer or representing PR agency to use and test for the purposes of this review. This did not affect the outcome of this review. I would love to try the Vanilla Nut, I love the taste of Vanilla in coffee. I would probably drink this more in the evening, I actually drink more coffee in the evening. I drink coffee first thing in the morning. I would love to try all three but I think the vanilla would be my fav! I’d love to try Mocha Mint! I’d like to try the Pumpkin Spice. I’d enjoy a cup after I have shooed everyone out the door in the morning and then I could sit and enjoy it. I think the pumpkin spice sounds really good. I would like it first thing in the morning. It would be a great way to wake up. I would like to try all 3 of these flavors but mostly pumpkin spice. Pumpkin spice would be best, after a weekend hike. Pumpkin Spice, when the baby goes to sleep and I need a little me time! I would LOVE to try the pumpkin spice! sounds sooooo good! I’m not a huge coffee drinker like my hubby is, but I love Mocha. 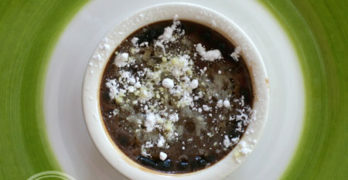 The Mocha Mint looks scrumptious! I’d love to try Pumpkin Spice the most and I’d enjoy it on the weekends w/ a slice of Spiced Pumpkin Cheese cake! I would like to try vanilla nut in the morning. I’d most like to try Mocha Mint in the afternoon as a delicious treat and pick me up. I’m already a subscriber to the WIC Project. I’ve been able to find all but the vanilla nut. I am dying to try it. I would try the mocha mint first… as a holiday season wake-up. vanilla mint because I like vanilla. I usually would drink it before finals week. I would like to try mocha mint. I would like to try all 3 but I would really like the vanilla. I’d try the pumpkin sice… first thing in the morning. I would like to try the Pumpkin Spice. Perfect for after dinner instead of dessert! Would be a toss up between Vanilla Nut and Pumpkin Spice. To pick one–Pumpkin Spice. Would enjoy as an iced coffee with cream and sugar. I would love to try the Pumpkin Spice coffee. I love anything pumpkin. I’ve already tried the Mocha Mint, but the Vanilla Nut sounds pretty good! Mocha Mint sounds delicious! I’d love to grab a cup when I’m out running errands on Saturday. There’s something so soothing about driving with a warm cup of coffee in my hand. Vanilla nut. I tried vanilla coffee once and loved it, but did not think that vanilla + coffee would taste good. The mocha mint sounds great. I’d like to try the Mocha Mint. I’d enjoy it first thing in the morning. I would love to try the pumpkin spice. I’d enjoy it in the morning. I would like to try the Pumpkin Spice with breakfast. I would love to try the Pumpkin Spice coffee…That would be a great and different coffee to serve at Thanksgiving.. I would like to try the Vanilla Nut the most and I would be enjoying first thing in the morning when I’m trying to wake up as usual! I like Dunkin’ Donuts vanilla custard cream donuts rolled in powdered sugar. I wanna try mocha mint! I’d love to try the Pumpkin Spice. I just bought the Pumpkin Spice and am enjoying it right now!! I can’t wait to try the Mocha Mint whenever it gets colder out. I love all of the holiday flavors but I cant find them in the stores yet. When will they we out?